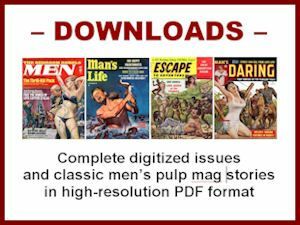 Men's Adventure Magazines: Yes, you are seeing double. Happy New Year! If you’re you’re reading this on New Year’s Eve, don’t worry. You are seeing double, but it’s not alcohol related. 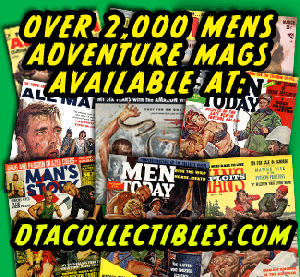 It’s an example of the same cover art being used for two different men’s adventure magazines. The action-filled cover painting above, by artist George Gross, was first used for the cover of the March 1957 issue of Man’s World (published by Medallion from 1955 to 1977). 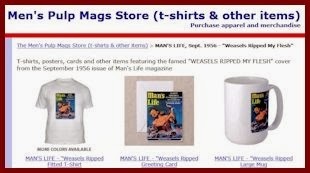 Gross’s painting was reused on the cover of the January 1961 issue of Action For Men (published from 1958 to 1977, by Hillman in it’s first year, and then by Vista, a Magazine Management Atlas/Diamond offshoot). 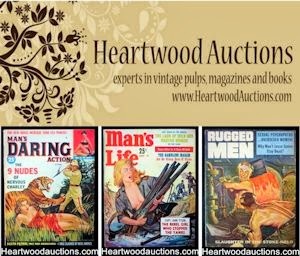 From the late 1940s to the mid-1970s, over 150 different men’s adventure magazine titles were published. Some were published by major publishing houses, lasted for years and had relatively large circulations. Others were published by semi-legitimate publishers on shoestring budgets, lasted for only a few issues and had minimal distribution. 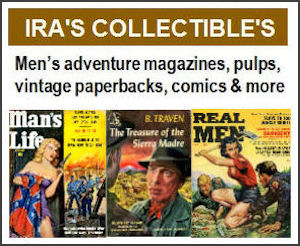 Below are more examples of cover art that was used on two different men’s adventure magazines: a great diamondback rattlesnake painting on Men magazine and A-OK for Men, and a Nazi scene used on both Stag and Action for Men. And, here’s wishing you an adventurous but safe New Year! Cheers!